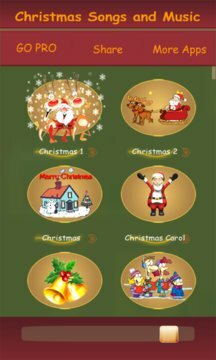 Christmas is around the corner, so prepare yourself for the Xmas season with our Christmas Songs and Music, and download Christmas ringtones now. Don`t wait until Christmas day, get into the holiday spirit now with Christmas songs and Christmas ringtones free, and Christmas sounds will be at your disposal. Xmas wouldn`t be the same without music and with that in mind we are bringing Christmas melody carols and Christmas songs that will put you in the right spirit. 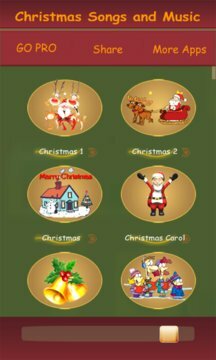 Best Christmas sounds will entertain you before and during the holiday season, so check our Christmas ringtones and get Christmas musicbox. Even Christmas ringtone can put a smile on your face, and you don`t have to spend Christmas without Christmas sounds. We also have Christmas melody carols that are great entertainment for the whole family. Both adults and children simply adore Christmas songs, and it will make you forget all the bad things thanks to our Christmas ringtones free. If you are in the mood, your cell phone should be in the mood, too. Spread some cheer and enrich your ringtones collection with Christmas ringtones free. Look no further than our app for ringtones & music and choose the ringtone you like best. All Christmas ringtones are fun sounds, and we are sure that music will create the magic before the holidays. Merry Christmas! Christmas is the happiest time of the year, when all family members are gathered around the Christmas tree singing songs and spending time together. There is no celebration without music, and no Christmas without music inspired by this joyful holiday. Enjoy with your loved ones in our app dedicated to Christmas and have fun with sweet Christmas sounds. You don`t have to wait till the Christmas day, why not have Christmas ringtones now? Prepare for the season and download ringtones to your phone. Enjoy in music every time your phone starts ringing. what`s more, all ringtones in this application are free, so you can keep your money and have ringtones unlimited. Let`s prepare for holidays, Christmas countdown starts now!